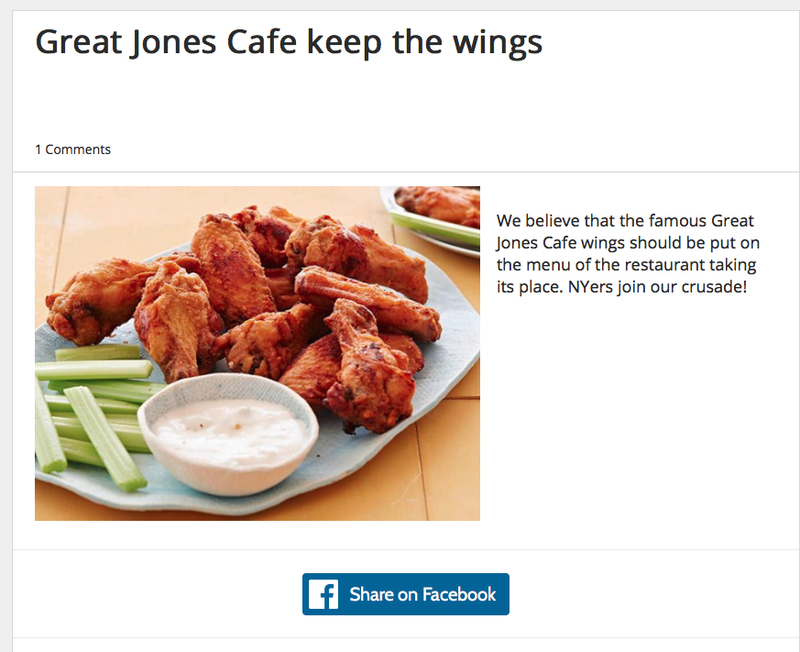 Someone has created a petition asking the new owners of the Great Jones Cafe at 54 Great Jones St. to keep the wings on the restaurant's menu. We believe that the famous Great Jones Cafe wings should be put on the menu of the restaurant taking its place. NYers join our crusade! As for the new Great Jones Cafe, the owners will be updating the menu, featuring a lot less Cajun-influenced fare as the original, which opened in 1983. However, one of the owners, Avi Burn, said the other day that they "will pay homage to the old menu with some GJ classics and some inspiration from the old menu." Perhaps that might mean wings. Doused in a homemade hot sauce that hits all the right sweet and savory notes, the wings have the crispy skin chicken wing lovers would die for. But that sauce—the sauce is so good that, after you've finished the wings, you'll drag all the thin slices of carrot and other veggies that garnish the platter through the dregs just to keep the flavor in your mouth. Thank you for helping to spread the word and providing a photo. The petition is updated and ready to FLY (get it? Wings? Fly?). LET'S DO THIS! 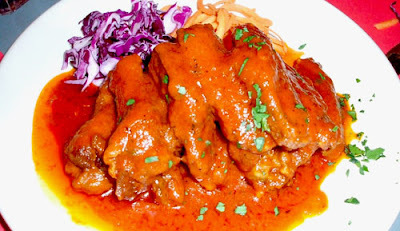 Although it's very nice that people fondly remember the Creole Wings from the ORIGINAL Great Jones Cafe, they should be aware that the new owners have NOTHING TO DO with the original Great Jones Cafe, other than the fact that one of them is our old landlord. They will not have the same Cooks, Staff, Management OR Recipes. The fact that they are planning to keep the old name seems to indicate that they want to CASH-IN on the history of a well loved 35 year old establishment. They might have wings or other nods to the past, but the NEW Great Jones Cafe will be the "Jones" in name only.